“This Art Student visited the Cottage Garden, and what happened next was a real challenge!” I really couldn’t restrain myself from click-bait copywriting there. Sorrynotsorry. 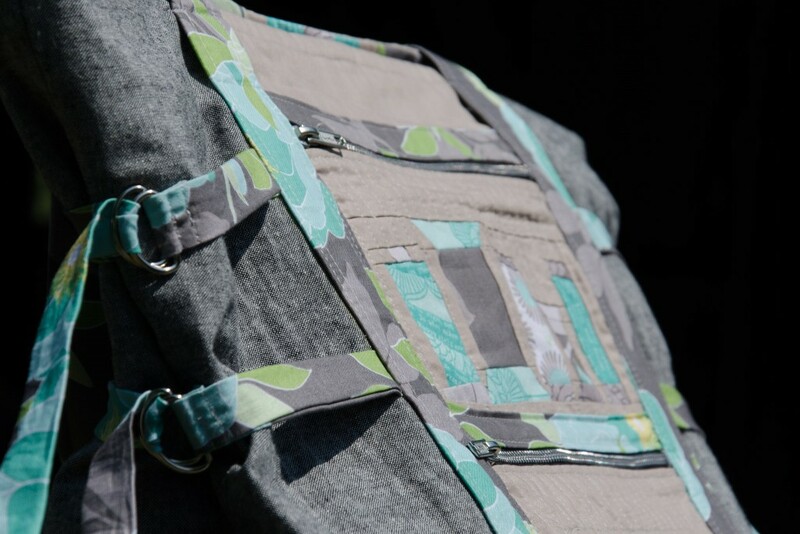 The MQG paired up with Riley Blake fabrics for a challenge this year. Those of us who were quick enough on the draw to score free fabric ended up with a pack of six fat eighths from the Cottage Garden line by Amanda Herring of the Quilted Fish. Make something you’ve never done before. 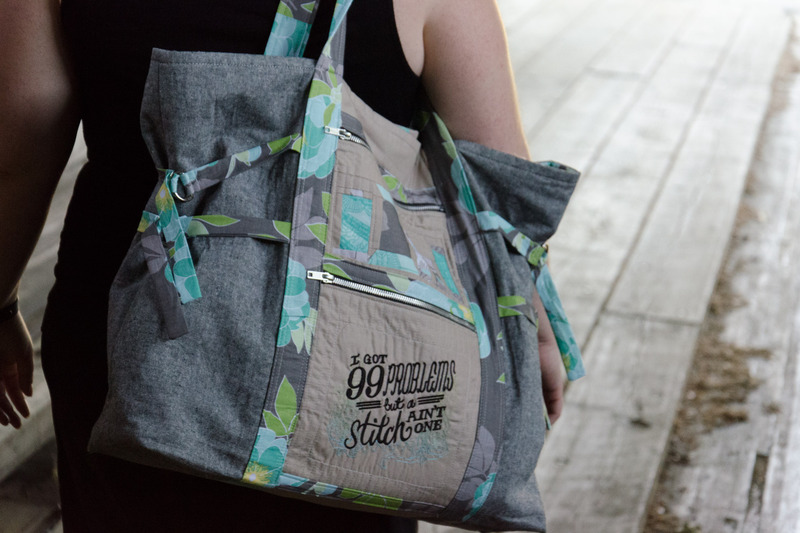 While I was pondering what to make, bags my fellow guild members brought to our sew-in in May inspired a bit of an obsession with Anna Maria Horner patterns, including her Art Student Tote. “…Quilted”? Well, I can quilt part of it, sure. “…Never done before”? I usually just make bags without a pattern to varying degrees of success. “…Learn something new”? 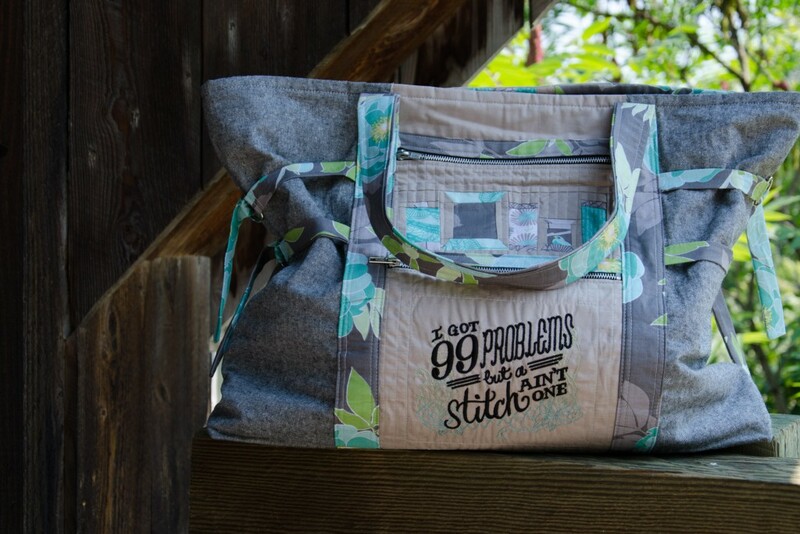 Well, the VT guild challenged us to learn paper piecing too, and I missed the demo while I was on vacation, and I can add quilted piecing to the bag, right? That was the long way of saying I decided to make the Art Student Tote for my challenge project and incorporate quilted panels. I may have forgotten and/or misread the whole “use only Riley Blake…solids” part of the instructions while shopping, so Kaufman Essex Yarn Dyed in black ended up being a substantial part of the bag. C’est la vie. 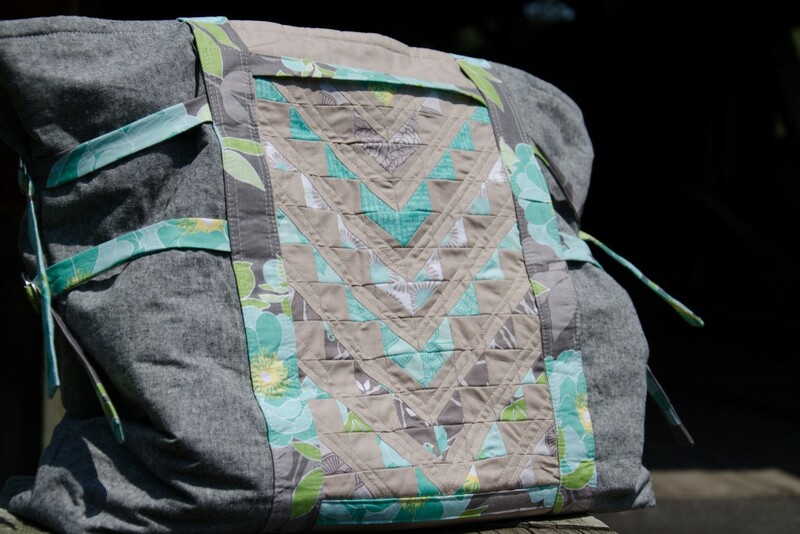 So, I might not qualify for the challenge (although I’m not the only one who used other things, from what I can tell), but I do have a usable product that I’m excited about, and Riley Blake sold a few extra yards of their fabric. 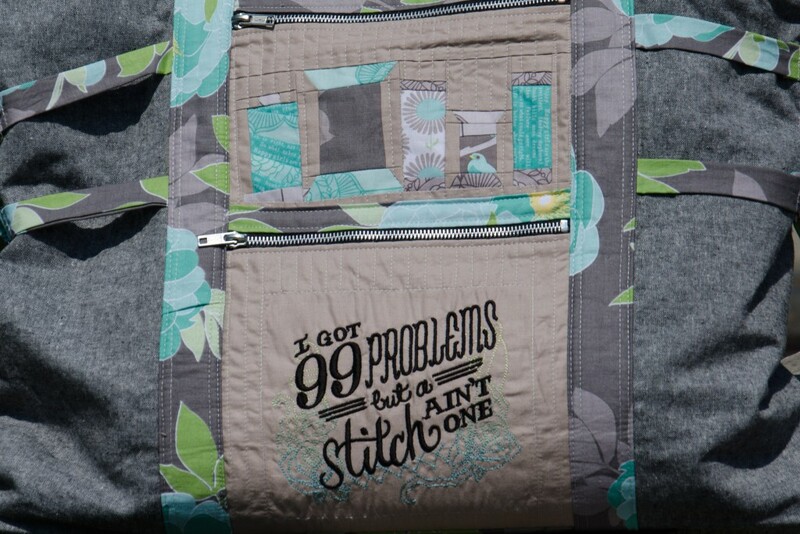 Choosing what design to use for the pieced section of the bag was difficult until I came across an Urban Threads embroidery that greatly amused me. Stitches need thread, so paper-pieced spools made complete sense. Ironically, my needle thread broke eight times while stitching out the embroidery. 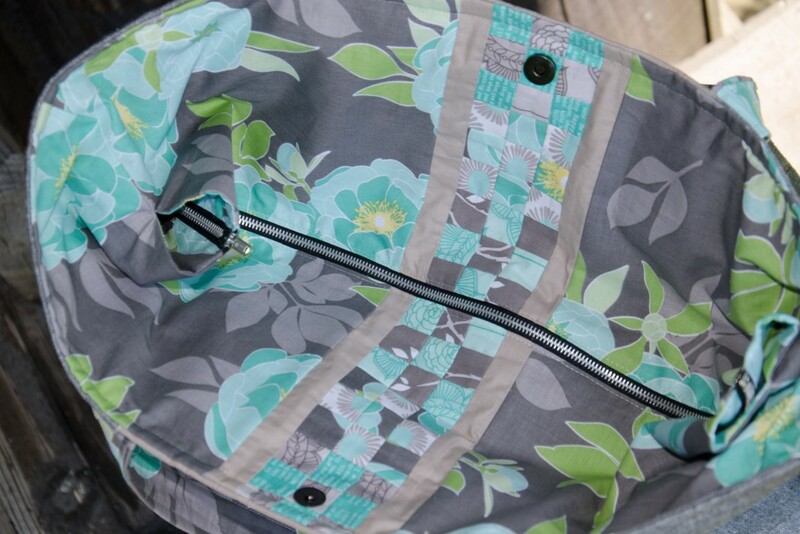 Although the pattern only calls for pockets on one side of the bag, I made a non-zippered one for the back. That way, I had an excuse for a center stripe of pewter on both sides of the bag and more opportunity to use the challenge prints. After making spools for one front pocket, I decided that I’d rather return to traditional piecing for the rest and made the back panel inspired by a quilt by Patty Sloniger of Beck and Lundy. Whether piecing 1″ half-square triangles was less painful than additional paper-piecing is still up for debate. I quilted all of the pocket fronts to flannel to keep them lightweight but structured (and quilted). 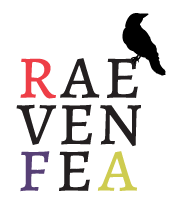 I made the version that includes an extension panel. Because I originally purchased the flower yardage for the lining only, I was about 3″ short when it came time to cut out the extensions. 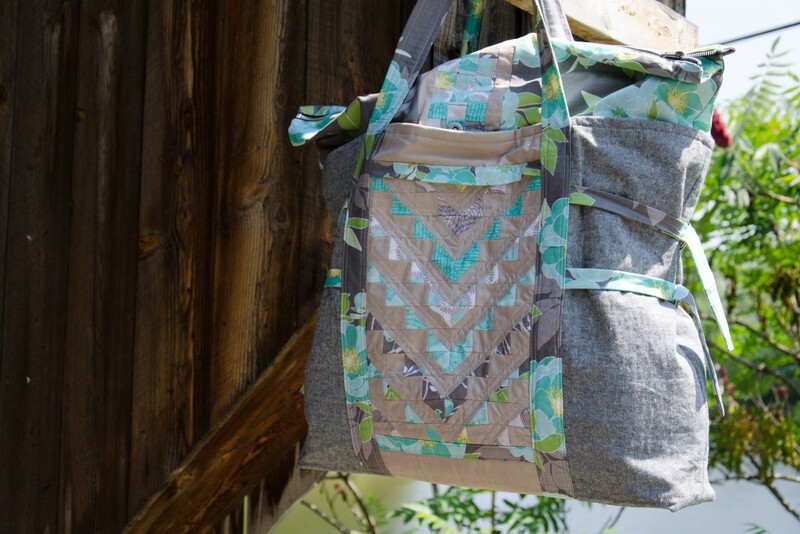 I saw it as one more opportunity to use the challenge fabrics, and pieced in a stripe of small nine-patches. Not everything was rosy. I don’t know if it’s me or the directions, but I had a very hard time following along with the pattern. I had to re-read things a million times, and it still didn’t make a ton of sense in certain cases. The pattern also seems to be missing markings for start/stop stitching on the extension panel. It all turned out okay in the end, but was disappointing for a paid pattern. If I make it again (likely with less piecing! ), I’ll leave off the extension panel. It may provide more room when you need it, but is a bit awkward when folded down inside the bag. Not to mention, the bag itself is already pretty large! I also need to find a way to hide the raw edges from my center stripe at the very top edge (my fault for lack of foresight when I modified the pattern that way). 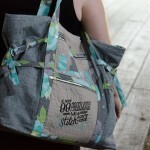 Regardless, it seems perfect for toting around projects and quilts that need to be photographed. I’m looking forward to using it to carry stuff for a sew-in next weekend! Just a short note to let you know your 1812 quilt is on display at Constable Hall just North of Utica for the next two weeks. It is upstairs in the Nursery since it had been originally designed as a baby quilt.